Wait just a minute! Go back a read that last word again... did he say "walking?" 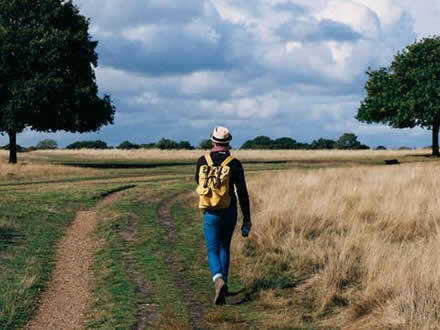 Yes, walking is an excellent, complete form of physical exercise that most people can take part in as often as they like, assuming they have the time. Of course, even if time is something we're rather short on, we still have to get up out of our chair and walk to get to places, even if it's only around the block or down a corridor from office to office. While we may be eating a pretty healthy low calorie diet, we can improve our health by getting the exercise our bodies need by walking. What we need to do in order to get the maximum health benefit from our walking is to learn to walk smart. When we walk in general, our pace tends to be slow, often more of an amble than a real walk as we have our attention on other things, such as daydreaming or being in conversation with someone we are ambling along with. This form of walking is of very little value other than to get us from one place to another albeit in the slowest possible manner. For women and men to lose weight, get fit and gain more benefit from our walking, we must pick up the pace and put some determination into the process. Walking smart is walking at an elevated pace, while not being too fast that it makes us look and feel awkward. It is all about putting some deliberation into each step with a forcefulness that displays our intention to get from one place to another in the shortest possible time without actually breaking into a trot. Of course, the best way to make use of our walking is to burn calories and this we can do by lengthening the period of walking time to more than twenty minutes. This twenty minute time span is the amount of time it generally takes for our muscles, when they are being moderately exercised, to deplete the blood sugar levels sufficiently to cause our bodies to replace them by taking from our store of fat and processing those fats back into burnable sugars (glucose). Strangely, it doesn't matter whether you are walking at a fast pace which is sufficient to make your breathing harder and your heart rate to be raised, or running full pelt. It still takes twenty minutes or so for your body to start the process to convert body fat to glucose. This is what makes fast walking, or slow running (jogging) or even cycling such an excellent form of exercise. That's because it improves your muscle stamina over time while similarly burning more of the excess calories (and fats) that are lurking in your body that you would rather be rid of. The beauty of this is that you can do this outdoors when the weather is fine and you get the additional benefit of getting fresh air and being outdoors when the sun is shining is uplifting for the spirit and a great mood enhancer, effectively reducing stress. As stress is a big factor in promoting weight gain for a variety of reasons that will be better explained in a separate article, it makes a lot of sense to do the kind of exercise that reduces stress. Walking for weight loss is an excellent way of doing this and one that is possible for most people to do at any time of the day and just about anywhere they like.